We offer 3 premium career tools for you to get the right advice to catapult your career! CAREER HMO - The ONLY one of it's kind, this virtual career coaching center is staffed by proven experts and offers you the chance to get the one-on-one help you need to manage your career and job search effectively. It's time you got a coach in your career corner - come see how a Career HMO can get you the results you want. 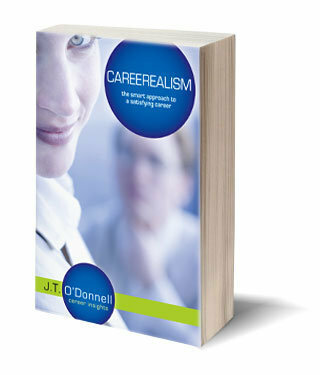 CAREEREALSM e-Book - This 144 page step-by-step guidebook was written by CAREEREALISM.com founder an nationally syndicated career expert, J.T. O'Donnell. She offers her highly successful coaching methodology in a way that readers can apply on their own. Info-packed and easy-to-follow, this tool will help you map out the kind of career satisfaction you want and deserve! C3 -Career Coaching Clinic - Join J.T. O'Donnell for a 3-hour intensive career coaching session. Each session is limited to only 20 attendees to ensure participants can get immediate feedback. You'll leave with a customized action plan for removing the roadblocks and getting on the high-speed track to careers success on your own terms. Ideal for those who are confused or struggling to find professional happiness. J.T. guarantees you'll leave the session looking at your future in an entirely new way!